Keyboard Design by BeeRaider; finally it's logical, ergonomic & compact. At BeeRaider we actually believe that our radical new keyboard design represents something of a landmark in the development of Human Interface Devices where data-entry by keyboard is concerned. In saying this, we feel that the merits of our unique keyboard design will only become apparent to those who take the time to read and understand why we believe this to be the case. From the outset we chose to take a radically different approach to creating our Radial Keyboard design. This choice to be different was not one we made just for the sake of being seen to be different. The differences in our keyboard design are the outcome of a long and deliberate process of ensuring that the end result was the best it could be. We think the outcome has been worth the effort. The Radial keyboard has been designed with a view to addressing the current shortcomings of the QWERTY standard keyboard whose layout was conceived in the 1870s for use on early mechanical typewriters. Unlike the QWERTY design, the Radial Keyboard has been designed to be logical, efficient, ergonomic and compact. These characteristics of the new keyboard design are considered to be especially relevant to the portable device market and users of smart-phone, tablet, net-book and laptop devices. The following topics are discussed in the sections which follow. The QWERTY keyboard layout was developed in an effort to solve a peculiar mechanical problem that first appeared on early mechanical typewriters. This problem occurred whenever a typist began to type too fast, and the returning key-hammer jammed with the next key-hammer traveling forward to print the follow-on character. This problem arose with the most frequently occurring English language alphabet characters (alpha-characters). The solution was to lay out the QWERTY keyboard’s alpha-character keys in such a way as to slow down a user’s typing speed. This solved the mechanical problem. Along with this, the alpha-characters for spelling the word TYPEWRITER were later deliberately placed on the top row of the QWERTY keyboard so that salespersons in the field selling the mechanical typewriters could easily demonstrate their typing proficiency by quickly typing this word to impress potential customers. The QWERTY keyboard was never designed with logic, efficiency, or ergonomics in mind and the reason for the QWERTY keyboard’s layout no longer now exists. It follows then that the design is both inadequate and inefficient in the context of how today’s computer keyboards operate. It’s fair to say that the vast majority of QWERTY keyboard users, even after years of usage, still don’t know where the alpha-characters (most typed keys) are located on the QWERTY keyboard and must look at the keyboard when typing. This further slows their already restricted typing speed. Obviously, those who would consider themselves trained typists are not included in this group. blank QWERTY keyboard layout and photocopy as required. Remove all QWERTY keyboards from view. Ask your friend(s) to write down on the keyboard-copy the location of whatever alpha-characters you care to call out to them. Even six randomly called characters should be sufficient for this test. When they are each finished, check to see how many alpha-characters they’ve managed to correctly place. Record the results and average the scores. Fold the copy-sheets and repeat if desired. You should find that most users don’t perform well on this test. The test shows that many users have failed to memorize the QWERTY keyboard’s alpha-characters layout, probably because of the inherent difficulty they have in memorizing it owing to its illogical layout. For this reason, these users are never likely to take the time required to memorize the QWERTY layout. 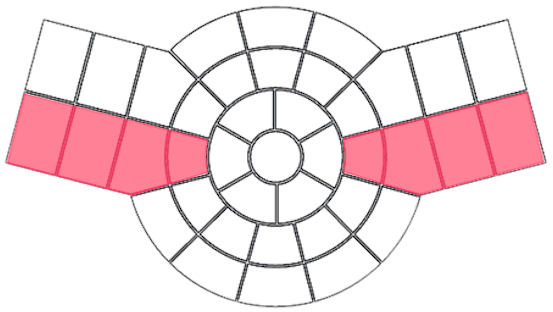 In contrast, the alpha-characters’ layout of BeeRaider’s Radial keyboard design can be memorized in as little as 10-20 minutes with finger-muscle-memory following soon afterwards. This effectively means that over time, users who apply themselves, should no longer have to look at the keyboard when typing. It’s expected that this aspect of the design will facilitate users in becoming self-taught touch-typists. In first setting out to fulfill the goal of designing the Radial Keyboard it was thought that the best starting point for ensuring minimum finger-travel time was to adopt the circle as the basis for the new design. This was an instinctive choice at the time because it wasn’t altogether clear just how it could be made to work. 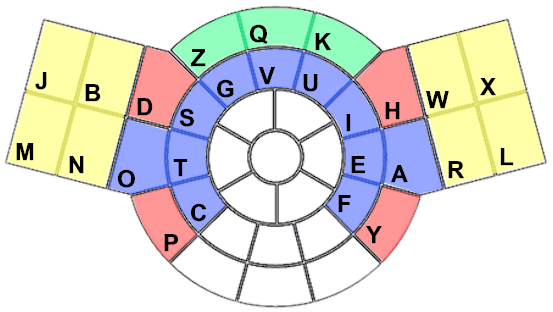 Several concentric circles containing as many keys as required to accommodate the full US QWERTY keyboard (with a few ancillary keys (not shown) was the result of this first attempt. This idea can be seen in the first of the three graphics below. To begin with, the alpha-characters were arranged in a sequential order starting on the right side and going from A to Z in an anti-clockwise layout. However, following prototype build and testing, this arrangement was found to be far from ideal, as it was too difficult to use in practice mainly because the lower keys prevented ease of access to the upper keys. 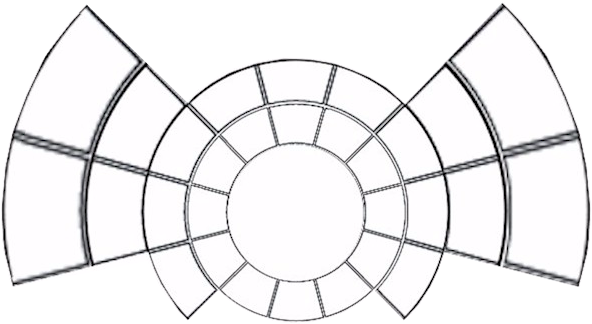 The second major design attempt shown above, improved the design by removing the lower section of keys as depicted. At this stage, practically all of the key-caps now contained multiple characters. Further design work was carried out with the intention of optimizing the alpha-character layout with the third major design attempt. It was decided to get rid of the sequential ordering of the alpha-character keys. It was thought that character-position-layout optimization was required, and that this would be best based on the character usage frequency in the English language. A pull-out (see graphic below) from the second design attempt containing those keys displaying the alpha-characters was felt to be the way to go. This approach led to a much reduced keyboard size and the resulting consolidation of the keyboard character set into this much smaller footprint proved feasible with some additional keys and adjustments to the design. 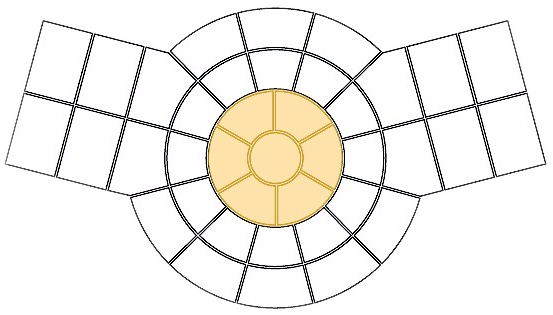 At this stage, there was now also one large space-key at the center of the design. It was also soon noticed how the distinct frontal outline of a bee could be seen in the design. This was rather fortuitous as it helped galvanize so many aspects of the design project and the subsequent design effort that was to produce the final Radial Keyboard design. 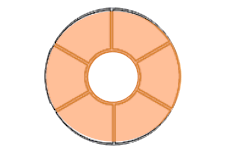 The Radial name comes from the fact that the keys of the design emanate from the center in a radial pattern. A radial pattern is one that appears to radiate from a point, like the spokes from the hub of a wheel. If preferred, instead of a wheel, one can also draw an analogy with the analogue clock. Another outcome from this observation was the company’s BeeRaider name. Efforts were now concentrated on developing and producing a design using this shape that would incorporate the necessary full-key complement of the desktop US English QWERTY keyboard. This was realized with a few additional keys (not shown). 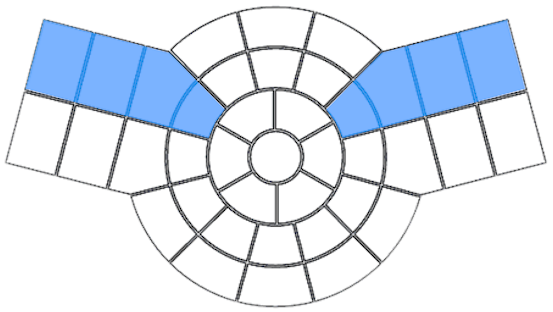 The main change at this point occurred with the decision to consolidate all the main modifier keys in the central (control) hub-area of the design, around a smaller diameter space key. This can be seen in the following graphic. 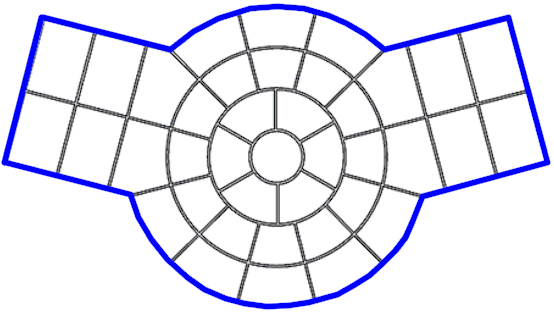 The next major design change was concentrated on the angle of the wings. Note that a bee has two sets of wings. Prototype testing showed that the angle of the keyboard’s wings at this time was considered to be less than ergonomic and resulted in a somewhat cramped typing style. 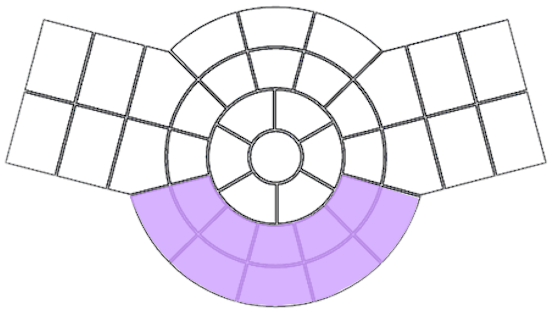 After further design adjustments involving multiple attempts, the final transformation of the angle of the wings resulted in the following version of the Radial keyboard. At this point, the design was nearing completion but one further design change was required before this could be realized. This involved the introduction of two further shift keys to allow for key-cap character consolidation. It was decided that these two new shift keys would be sticky in operation, which meant that they would be active (without holding) immediately after being depressed and would remain so, until a valid paired key was activated along with it. This feature is intended to improve user-typing speed. The three shift keys were later moved to bottom-centre of the keyboard layout, where a user’s thumbs could be used to easily operate them. Their operation is fully explained on the Training page. This situation has changed somewhat in the case of our physical keyboards where a thumb-operated space-key has been retained by popular request. The intention here is to familiarise the user with the various Radial Keyboard design aspects so that they might more easily understand and adapt to using the new keyboard. The Training page contains more specific information on how best to use the new design, both in a formal and informal typing-style approach. It’s thought that the bee analogy should prove popular with children learning to type for the first time. We have already mentioned how the Radial Keyboard design looks like a bee and now we can look more closely at how the features of the new design relate to the various parts of a bee’s body. The space-key is located at the center of the keyboard and acts as a kind of reference key whenever a user chooses to type in an informal or free-form typing style (see Training page). 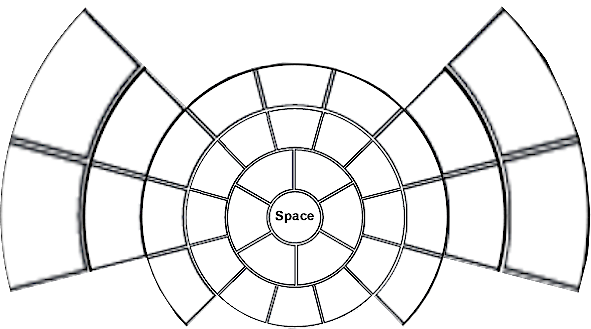 Arranged around the space-key are the modifier keys. Combined together they form the hub of the keyboard’s key-set arrangement and can be equated to the bee’s brain. If a user should decide that they want to type in a more formal manner (see Training page), then they will need to know that the bee’s lower set of wings contains the eight Home Keys (four each side). The optimization of the keyboard layout for the alpha-characters is based on the frequency of occurrence of these alphabet characters in the English language. Their ultimate position however on the Radial Keyboard is also purposely derived to coincide with the dexterity of a user’s fingers. The index finger being the most dexterous one, followed in turn by the middle, ring and little fingers. In general then, the following statements would hold true for the position of the most frequently occurring characters (from most to least) and the finger(s) one might use to type them. The characters located in the area highlighted in blue above are (generally), those characters, which occur most frequently in the English language. This means that when typing a document, a user’s fingers will travel to this area of the keyboard more frequently than other areas of the keyboard. These keys are therefore arranged so that they are closest to a user’s index fingers. Remember, the index fingers are the most dexterous of the digits. This facilitates speed of typing. Notice also that the smallest keys on the Radial Keyboard are equivalent in size to their counterparts on a full-sized desktop keyboard. The next most frequently typed characters are (generally) those shown highlighted in red above. 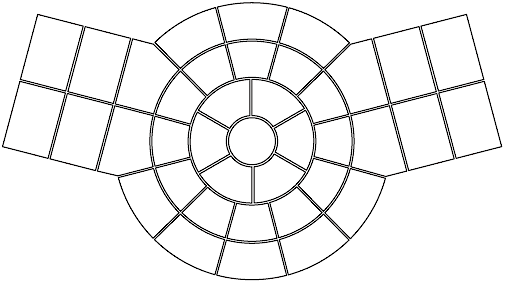 These can be thought of as being positioned on the second concentric circle, which has the central-hub (bee’s brain) at its center. 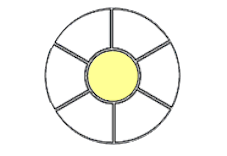 Likewise, concentric circles can be imagined for the W, R, B, and N keys (3rd concentric circle) and the X, L, M, J keys (4th concentric circle) respectively. Note how these keys are considerably larger than those located on the first concentric circle, as are all other keys. This means that the less dexterous fingers, such as the middle, ring and little fingers, all have bigger key-cap targets to aim for, which should facilitate an improvement in the typing accuracy of these weaker digits. The next most frequently typed characters are (generally) those shown highlighted in yellow above. 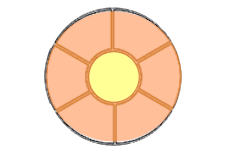 These can be thought of as being positioned on the third and fourth concentric circles and they also have the central-hub (bee’s brain) at their centers. The second concentric circle also contains those keys highlighted in green above, which represents those characters occurring least frequently in the English language. Being positioned at the top like this, means that finger travel requirements to this area (bee’s upper body) will be minimized. The remaining keys located at the bottom of the keyboard layout, consist of the main punctuation marks along with three of the ten numerals and of course the three Shift keys which are conveniently placed for operation by the user’s thumbs. Again, this situation has changed somewhat in the case of our physical keyboards. The new keyboard design is being presented as a serious contender to the standard QWERTY keyboard and other competing alternatives. The case for change has never been stronger with the advent of Digital-Convergence now giving rise to a myriad of ever smaller portable devices. The future is about portability, connectivity and wear-ability. With these changes in mind, it seems rather obvious that the standard QWERTY keyboard no longer meets the requirements of a modern data-entry keyboard device.